QVS's WePresent WGA-310 VW-4PHU VGA/HDMI Wireless Presentation System allows you to connect any Windows/Mac computer or Android/iOS device with Wi-Fi to a projector or HDTV with VGA or HDMI ports, and display up to four users simultaneously. This unit gives you the ability to screen mirror your system. The conference control function is suitable for classrooms or training sessions where an administrator is present. It also features a Wi-Fi access point, log-in protection for secured access, changeable standby splash screen, and the built-in DHCP/SNMP provides installation flexibility. It supports 10/100BaseT Wired-LAN, Wi-Fi iEEE802.11b/g/n, A/V streaming up to 720p, BrowserSlides, SidePad, and DirectX application projection such as AutoCAD, ProE, and computer games. It works with Windows 8/7/Vista/XP/200 and Mac OS X systems. Note: Limited support for iOS and Android devices. 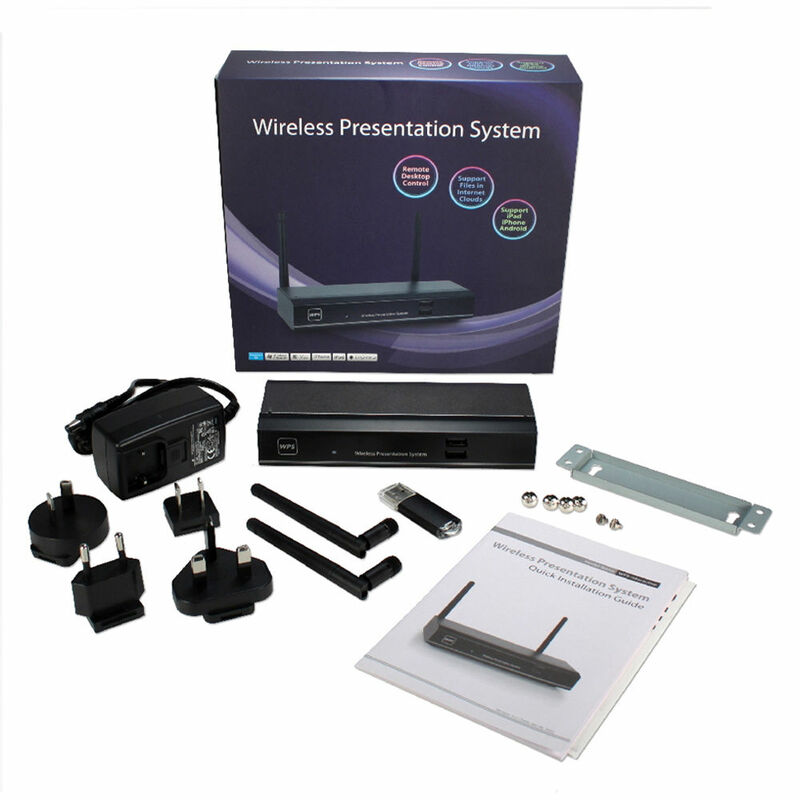 Box Dimensions (LxWxH) 8.6 x 8.2 x 2.6"
WePresent WGA-310 VW-4PHU VGA/HDMI Wireless Presentation System is rated 4.7 out of 5 by 3. Rated 5 out of 5 by Joseph H. from Well built, fires right up! We used this in a boardroom install. It worked right out of the box. Great picture and sound. Nice metal construction as well...feels like a quality item. Rated 4 out of 5 by rogerracer from Easy to install Seems to work like our previous one that died after 2 years. Surprised to find no on/off button! Rated 5 out of 5 by Rec from WPS System Works great easy set up. Can you access the device through the wired lan? This is a Wireless Presentation system. You can connect the WGA-310 to the Network or router with an Ethernet cable. Will the VGS and HDMI on this work at the same time to different displays? Yes. It will output from VGA and HDMI simultaneously to two different displays. Since it uses wifi to connect, are you able to still access the internet by wifi even when you are connected to the presentation system? Yes it does. It will not interfere with internet connectivity,.